This gluten free, vegan, Healthy Apple Crisp Recipe is made with such nutritious ingredients you could totally eat it for breakfast, but it’s also scrumptious enough to serve for dessert. I think this just might be the easiest dessert I’ve ever made! 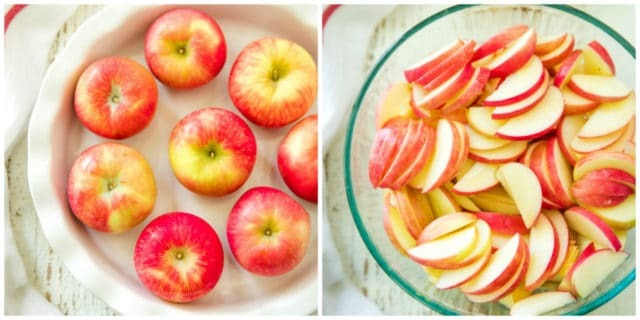 After chopping the apples, it can be thrown together in less than 5 minutes. And let me tell you, this apple crisp is a real crowd-pleaser. It didn’t even last a full day in the Lee household! 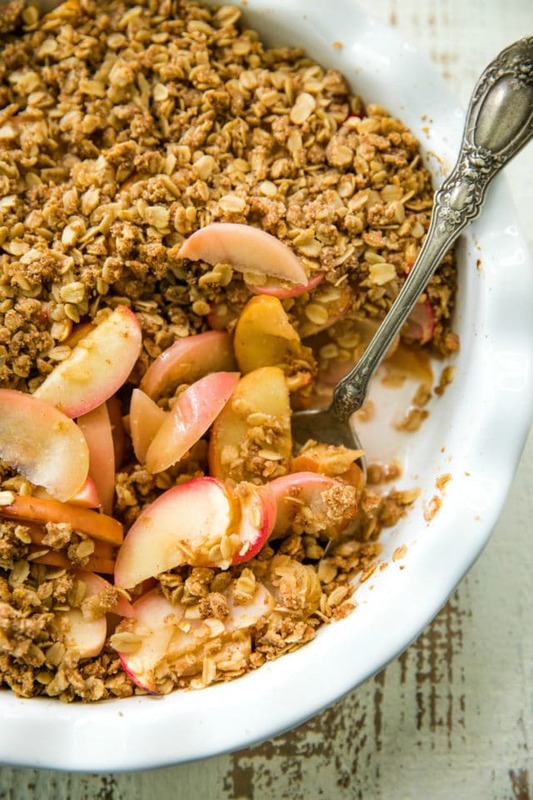 WHAT MAKES THIS HEALTHY APPLE CRISP SO SPECIAL? This gluten free apple crisp recipe has a simple ingredient list. From fresh organic apples to wholesome gluten-free rolled oats- there are only eight simple ingredients required. It’s so quick + easy! 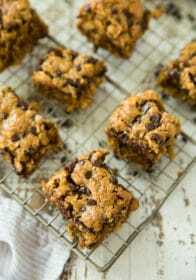 Throw this delicious dessert together in a time crunch and love the results. 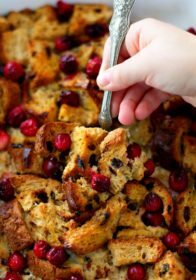 A dessert that goes from its baking dish in the oven directly to the table is always a winner. I hope y’all get a chance to make this healthy apple crisp recipe very soon because it’s truly one of my favorites! It’s so much easier and quicker to make than pie and, in my opinion, just as wonderful. Thanksgiving will be here before you know it and this apple crisp would be a lovely addition to the menu. My favorite way to serve it is with vanilla bean ice cream because why not?! 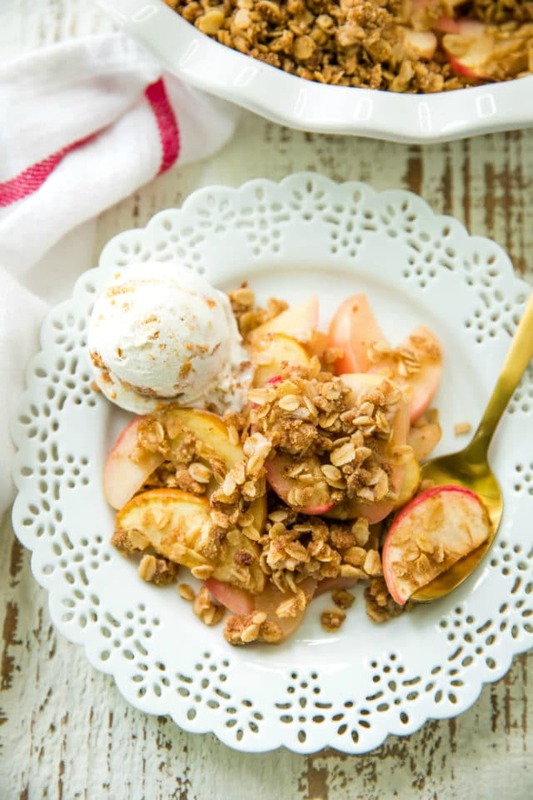 LIKE THIS HEALTHY APPLE CRISP RECIPE? YOU MAY ALSO LIKE THESE! 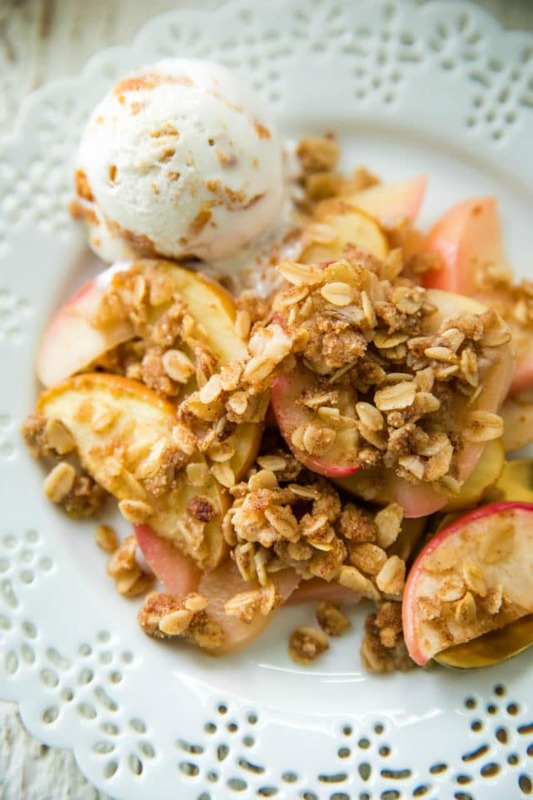 Apple Crisp is an easy dessert that takes so little time to pull together. You’ll have this crisp going from your oven to the dessert table in no time at all! Preheat oven to 350ºF and spray a 9-inch pie plate with a natural cooking spray. 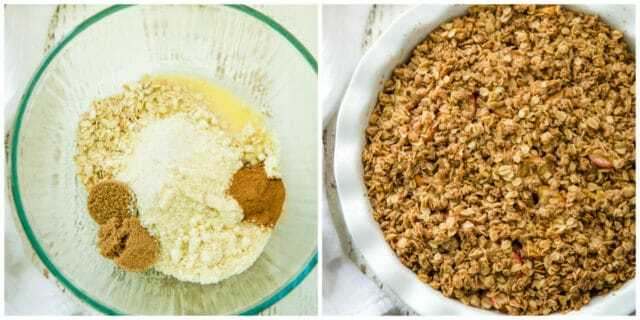 Combine all filling ingredients in a medium bowl and transfer to pie plate. Apple slices will almost be overflowing out of pie plate. Combine all crisp topping ingredients in a medium bowl. I like to use a fork to get them fully combined. Evenly sprinkle crisp mixture over the top of the apples. Serve warm and with vanilla ice cream, whipped topping or coconut cream, if desired. *You can peel, if you'd like, but I don't. **Honey is not vegan. I used a sugar free, calorie free pancake syrup. ***I used a brown sugar/Splenda blend. ****Any butter or even coconut oil will work. Omg.. .I am loving this. I have all plans to make blueberry crisps this week. Might as well change mind after seeing your post. 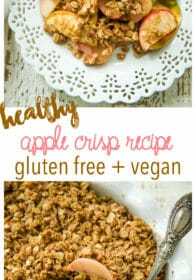 Love the idea of a healthy apple crisp! It’s great that you can make this is just one baking dish and it’s so easy to make! This looks absolutely amazing! 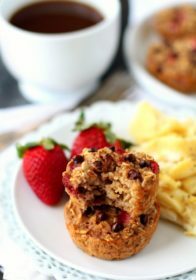 Love the idea of dessert for breakfast….I’m in! growing up every fall, my mom would always make apple crisp with our apple picking haul! I’ve gotta try this recipe it looks so delicious. 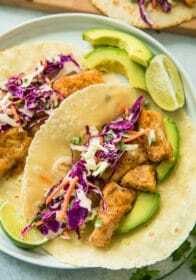 I love how simple yet delicious this recipe is. My family will love eating this healthy apple crisp. 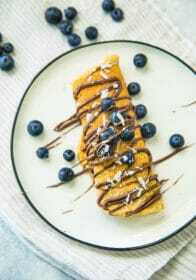 I love healthy desserts like this! I try to eat healthy, but I have such a sweet tooth! This is perfect! I love apple crisp. 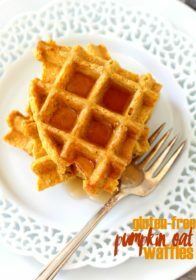 It is much easier and healthier than making pie, and you’re right, you could totally eat this for breakfast OR desert. Great recipe! This is beautiful! The skin on those apples! And sounds super delicious! I’d love it for breakfast or dessert!